If there’s a drought, you should water your trees, as well as other shrubs, once every 7 to 10 days. For older trees, you can water them every 14 to 21 days, as they will have roots that are much more widespread and thus, able to find water more easily. If you water your trees too much during a drought, this can actually cause more harm than good by causing over saturation. It’s important, in between watering your trees, to make sure that the first few inches of the soil have dried out. The best time of the day to water your trees is during the morning. That’s because, during the morning, the sun will not be out, meaning that water will not evaporate. This gives the water a better chance to get down into the soil so that the trees roots are able to absorb it better. The early morning hours are best. When watering your trees during a drought, be sure to water them past the drip line. You should not water the tree just at its base. Most trees will have roots that expand 2 to 4 times past its canopy. The second thing to do is to make sure that when you water the trees, the water is able to penetrate at least 12 inches into the ground. The vast majority of roots are present in the first foot of the soil. A useful tool to use to make sure that you’re able to follow this is to use a soil probe. You should also use mulch between each time that you water the tree. You should use around 3 to 5 inches of mulch, which should be organic, as that will help to preserve the moisture in the ground. 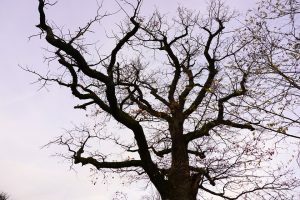 A tree that is regularly pruned, such as one that has damaged or dead branches removed, will be healthier for it and better able to withstand a drought than one that hasn’t been pruned. It will improve the tree’s stability and its overall structure, which are both important factors to consider. Lewis Tree Service has close to 30 years of experience in helping residents in the Santa Cruz area overcome droughts. Contact us today for a free quote and to have one of our ISA certified arborists sent to examine your property to see what can be done!